Modern glazed doors, whether they be bi-fold doors or sliding doors, are one of the most sought-after features in today’s homes. Equally, they are one of the main additions people use to maximise natural light in the home when undertaking an extension or renovation. Choosing the right bi-fold or sliding doors for your house is important, both practically and stylistically, and they could quite easily become the wow-factor design feature that you have been looking for. To make sure you make the right decision, follow our guide to choosing the perfect glazed doors for your project. For all things doors, check out our dedicated hub page. Extending a house? Find out how to plan a house extension. Bi-fold doors – which are also known as folding-sliding doors – slide open panels concertinaing neatly together. They can also include a standard-style door at one end, which you can use to go in and out without having to fold the panels. Bi-folding units can open inwards or outwards, and most people choose the latter option to maximise space inside. With examples that open outwards, you don’t need to worry about the furniture inside the room getting in the way of the folded leaves when the door is open. Half-in, half-out options are always available; these might work for your space, but offer the worst of both worlds in terms of getting in the way both indoors and out. 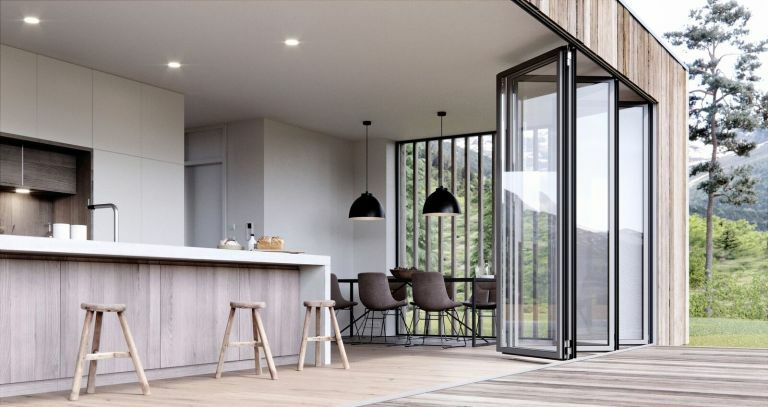 ‘With a bi-fold door you can open up a whole wall, giving a connection to the exterior space,’ explains Matt Higgs, co-owner and sales manager at Klöeber. Sliding doors open by moving to the side, with the panes fitting behind one another. You won’t be able to fully open the room in which they’re fitted to the outside. Hidden pocket versions are possible, allowing the sliding doors to be inserted into the wall to create a complete open wall. ‘With a sliding door you get the benefit of larger expanses of glass and the view isn’t impaired by as many frame lines when the door is shut,’ adds Matt. Sliding doors are a popular option when space is limited because they don’t require room to manoeuvre inside or out. Sliding doors are worth considering if your priority is your view and you wish this to be as uninterrupted as possible by framing. Usually, a sliding door does not provide a 100 per cent opening unless it can slide into a pocket, in which case you might end up with more solid wall than you want within the room. Typical sliding door configurations provide a half, two-thirds and three-quarters opening. These doors are ideal for larger openings. If you have a large opening and you are opening up to two thirds of it, this can give you the inside outside feel without the whole opening being clear. Like bi-folding doors, sliding doors can have level and weathered tracks. How much do bi-fold and sliding doors cost? You’ll need to budget from £480 per square metre for bi-fold doors with an aluminium frame, and £600 per square metre for sliding doors. Bear in mind that for both sliding and bi-fold doors, the frame material and its dimensions will influence the cost. As a rule, uPVC offers the least expensive option and aluminium the most. Panel sizes also affect the final cost of your selection, with larger sizes more expensive. You might want to factor in whether the doors have integrated blinds, or if you’re going to buy a window treatment separately for use in the evening. If privacy is an issue, consider integrated Venetian blinds that sit within each glazed unit and are manually or remotely operated. Use our guide to window treatments for bi-fold and sliding doors for ideas. Finally, don’t forget that both off-the-shelf and bespoke glazed doors are available, but you’ll pay accordingly. Do I need planning permission for the doors? Changing or adding doors and windows to a property is usually classed as permitted development (PD), so permission is not normally necessary for folding sliding doors. However, PD rights can be removed or restricted by the local authority, especially in a conservation area and other designated areas such as National Parks. Flats do not have PD rights, so planning permission will be required. Any material alteration to a listed building will need listed building consent. Where permission is required, it will usually be granted if the alteration does not affect the principal elevations of the house – usually the front. Some local authorities may require the doors to be made from timber in a conservation area. In all instances, the responsibility is yours as the homeowner, so check with your local authority whether or not permission is required. Are there any height limits? All manufacturers will advise the individual height their systems are able to achieve. Normally the maximum height is 2.4m, although some manufacturers offer taller systems with a higher specification on the running and hinge mechanisms. When it comes to opening sizes, bear in mind that most off-the-peg FSDs cover only a maximum of around five metres, so for a floor-to-ceiling wall of glazing you may need to go bespoke. The latest bespoke designs can be used to create stunning curves, and even navigate around corners, so you can open up your entire ground floor. Such designs will need extra structural support. How many panels are required? The number of door panels used depends on the width of each one individually, but it is best to go for as few as possible. The maximum width of each door panel is around 1m to 1.1m for folding sliding doors. Tall panels are often narrower to reduce the weight of the doors. When specifying bi-folding doors, it’s always best to think in odd numbers. With an odd number of panels, the doors will fold and slide in the same direction and it will give you a lead door with a multipoint locking system. For an even-number configuration, it is always advisable to split the set up into odd operating numbers (for example, a four-door design should be split into a three-plus-one set-up) to ensure there is a lead door with a fully operational multipoint lock. It’s best to leave the configuration up to your provider as they should know what works best, but specify that you’d like a lead door with a multipoint lock. Popular glazed door frame materials include metal, wood, uPVC and composites. ‘The first thing people should consider is the type and period of their property, closely followed by the maintenance involved in the chosen material,’ says Noreen Williams. A traditional property may suit engineered hardwood timber, but bear in mind that these doors will need to be repainted or stained regularly to keep them looking good. Simple timber doors can be prone to twisting and warping – this is where engineered or cross-laminated timber comes in. Composites, a low-maintenance alternative to wood doors, has timber frames clad externally in powder-coated aluminum – giving a weatherproof exterior, but an attractive natural wood finish to your traditional interior..
Metal frames, such as aluminium, are also easy to care for, and give a more modern look. Durable, low-maintenance and strong enough to allow very minimal frame dimensions, aluminium is the most suited to bi-fold and sliding doors, and can be finished in a wide range of colours using a low-maintenance powder-coating process – see our guide to metal doors and windows for more info. uPVC maybe the best choice If budget is key, or you’re trying to match your new doors to your current windows; new colour options, other than white, are now becoming available. uPVC should generally be avoided in character period homes. The material will also affect the dimensions of the frame – and therefore the amount of glass you can have – with aluminium generally being the thinnest and uPVC the thickest. The system and size of the doors will determine how long your doors take to put in. ‘Ideally, the installation should be one of the last elements of a build process to ensure the doors, and probably most significantly the track, are protected from ongoing construction work,’ explains Carl Farrow, technical development manager at ID Systems. Typically, a bi-fold door of up to six panels would be completed inside a day by a single team of engineers, says Carl. A larger system, including doors with bigger panes of glass and complementary products such as glass roofs, may take multiple engineer teams two or three days. Should I choose double or triple glazing? When you’re selecting the glazing option, pay attention to its U-value, which measures the heat insulation properties: the lower, the better. You’ll usually find that the higher cost of triple glazing is not reflected in a lower U-value, making double glazing the best option. Most suppliers recommend calling in a glazing specialist for measuring and ordering – although taking on the job yourself is possible. ‘You can measure by taking multiple dimensions across the width and height of the aperture, taking the smallest of these and taking off a tolerance (an allowable amount of variation) identified by your door supplier,’ says Matt Higgs at Klöeber. A reputable company can talk you through the ordering process, and give you technical drawings and instructions to help you. You’ll always need specialist help with the installation process – make sure the glazing installer you choose is Fenestration Self-Assessment Scheme approved. What security features should I be looking for? Security should not be a concern with bi-folding doors, even if you’re installing large expanses of glass. Just ensure the doors have a locking system that meets the police preferred ‘Secured By Design’ standards. Choose a manufacturer that includes accredited, insurance-recognised locks – at least a five-lever key cylinder – as standard. The weakest point of a locking system is often the cylinder, so look for cylinders that are resistant to snapping, picking, drilling and bumping. Good-quality products have integrated multipoint locking systems, with hooked locks and shoot bolts. The police are raising awareness of door lock security as part of their ‘Secured By Design’ initiative, working with BSI (the UK’s national standards body) to create a new cylinder with extra protection, indicated by a Kitemark alongside three stars. The quality of doors and hinges is an important factor in security, as is ensuring the frame is firmly fixed to the walls. It’s worth looking for an internally glazed system, as with an externally glazed design it may be possible to remove the beads and double glazing from outside to access the property. In addition to security, check out the operation of the doors to make sure they are simple and reliable to use. If the system seems fiddly or clunky, look elsewhere. Adding bespoke blinds will give extra privacy if needed. Will bi-fold doors suit the style of my home? 'The type of material you choose is the first, and most important consideration and largely depends on the style of house you live in, whether you want a statement or sympathetic look and colour, and your personal design preferences, including the amount of glazing you’d like and how much light you want to introduce to your interior spaces', explains Steve Bromberg, general manager at Express Bi-folding Doors. The current trend for contemporary-style extensions has seen a rise in demand for aluminium designs because of its strength, aesthetic and low maintenance requirements, but timber can also be used for a more traditional-style finish. However, bear in mind that timber needs more regular maintenance to ensure the wood is kept in good condition and to prevent rot, and as it is not as slender as most aluminium styles, typically timber doors won’t let in as much natural light. The opening configuration of the doors is also an important consideration, as this needs to work in line with the day-to-day use of the home and garden. If bi-folds are to become the main traffic door from inside to out, consider a design which incorporates a pane that can be opened and closed as a singular unit, as well as part of a full-width opening. What bi-fold and sliding doors designs are available? Sliding and folding-sliding doors come in a wide range of styles to suit all budgets, from off-the-shelf to bespoke designs. Sliding systems: Parallel tracks both top and bottom, support the door unit. One slides behind the other and the weight bears down on the floor-mounted tracks. Door panels can be stacked internally or externally, the latter often preferred as valuable floor space isn't eaten up inside. Pocket sliding systems: A pocket system is used where you want to open an entire wall up to the outside. The panels slide into a recess in the wall, rather than one over the over; these are often used for corners. Top hung systems: As the name suggests these are hung from a track above. They require a steel lintel to take the weight of the doors. With no track at the bottom, these offer a level threshold that won't trap dirt or debris. Bottom rolling systems: These move on floor-mounted tracks – a good choice where it isn't possible to have a steel lintel above. Access doors: If the area with bi-fold doors needs regular access then a single panel access door that can be opened independently of the bi-fold should be specified. Inwards or outwards hung: This indicates where the doors will stack in relation to the threshold once open. Inwards hung will stack internally and outwards externally – which is usually what people choose to save internal space. You can get half-in-half-out options too, but these are the best (and worst) of both worlds so ask for visualisations of each. Look out for higher performance glazing, blinds (electric or manual), additional profiles to incorporate trickle ventilation, oak timber in timber doors, textured paint finishes, marine environmental finishes, cat flaps in the glass (they have to be round), or moveable corner posts. Some suppliers offer made-to-measure blinds, such as roller, panel, roman and vertical styles in a range of fabrics, textures and colours, to fit in front of the glazing to complement the doors. Most suppliers can fit integral blinds, which are positioned within the double or triple glazing. Adding blinds to your doors can work with your interior design scheme to finish the look in your home, as well as creating more privacy. Can I have a level threshold between the inside and outside? Many well-designed systems offer a level threshold – where the top of the floor track is flush with the floor, and internal and external floor levels are the same. However, this could have a negative impact on how watertight the space is. It is therefore very important to incorporate drainage facilities and to ensure the external floor slopes away from the threshold gradually so that water does not pool in front of the doors, as this water might then be forced through the threshold in a driving wind. In a highly exposed area, it is possible to achieve the appearance of a level threshold by building up the external floor level in timber decking or another free-draining floor finish so that it is level with the internal flooring, while maintaining a minimum 75mm upstand to protect against water ingress. Threshold designs vary, but bear in mind that flush or low thresholds can’t be completely weatherproof. Discuss the drainage options with your provider and be aware of the doors’ rating according to British Standard BS 6375-1, which relates to air permeability, watertightness and wind resistance. Bi-fold doors are as popular as ever with homeowners looking to introduce more light and bring a sense of the outdoors into their home. But how do you know if aluminium is the right material for you?